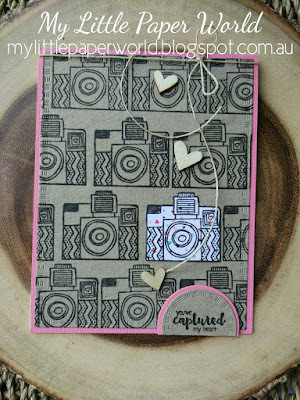 Today I am sharing a card using Unity Itty Bitty - Captured My Heart (Artist Lisa Arana). These cards were made for their current Unity Challenge which can be viewed here - Unity [Show & Tell]. I really like this image - so much so...that I decided that I would create a few cards with it. I got a little carried away with the stamp and my MISTI tool. It can be quite difficult to decide when to stop! My first card (below) was originally a line...I then added another line, and then another line and then decided I had to create a background of camera images. Sequins range in colours and sizes. Each pack contains 1 Tablespoon of sequins. 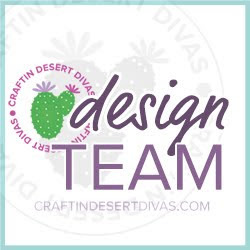 Perfect for all your crafting needs. These sequins are now available for sale, you can purchase them through my facebook group - here or through my webstore - here. Please feel free to ask about postage cost. All prices are in Australia Dollar. PayPal available. This card uses Unity Stamp - Tea Love. I went around each image with prismacolor pencils and used washi tape, enamel dots and My Little Paper World Corner dies to give it a little more interest! I really like how bold and bright this card turned out and... 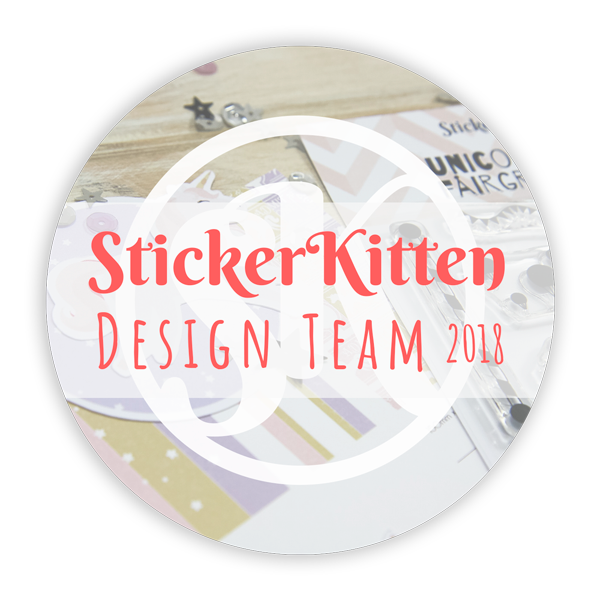 I was able to use some left over card stock - I've been clearing out a few craft items and didn't want to waste those cut off bits that I'm sure we all collect! Ends 31st May 2016 so get your entries in! 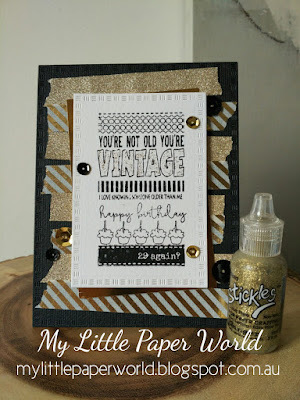 Just sharing a quick card I made using My Little Paper World Corner Dies. Simple inlaid technique which I decided to leave blank so that I can use it for whenever I need to. It's always good to have a few blank cards available in the card stash! These dies are on sale this weekend! Friday 27th - 29th May 2016. 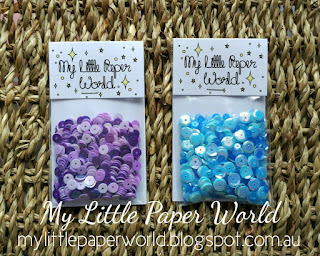 Get your set for AU$18.00 (normally AU$20.00) plus postage. 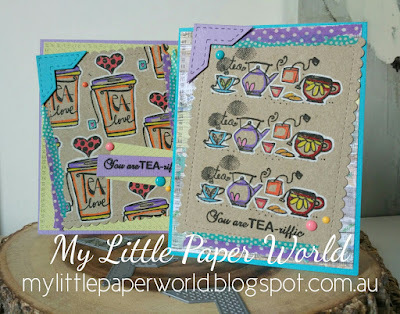 Please email: mylittlepaperworld.enquiry@gmail.com or send me a private message through My Little Paper World's Facebook Group for a invoice (PayPal). Note: Sale price will not be changed on webstore. Don't you love it when a card just creates itself? I do! This card came together so easily, that I made a few to add to my card stash collection! 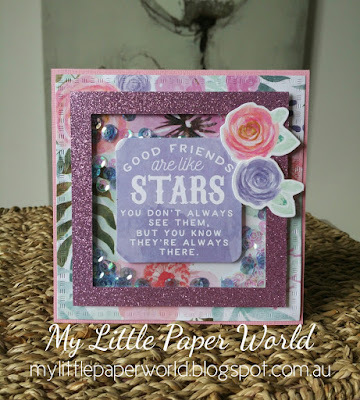 I used My Little Paper World Rectangle Nesting Dies - TRIBAL, washi tape, some gold card, sequins, glitter and of course my latest purchased stamp from Unity - Vintage - Older Than Me. The other day I wanted to try an idea with a stamp set I've had for awhile. I thought I'd take a few quick photos to share my process. Nothing fancy, certainly a technique that many card makers have used but a fun one that can be used in so many different ways! I first cut a piece of white card (Canson) slightly larger than my 4.25"x 5.5" rectangle die (MLPW rectangle nesting dies -TRIBAL). I marked where the die would cut so I could work out where to stamp the images. 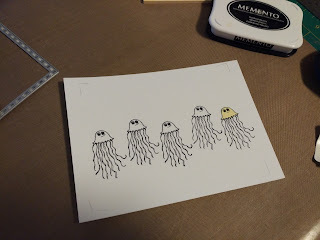 Using Unity 'under the sea' stamp set I stamped the jelly fish 5 times in a row. I used post-it notes to mask off the jelly fish faces. Once the faces were masked, I used painters tape to mask off another area. TIP: I also added an extra row to the top to cover all the white, as I didn't want to get any ink on this area. 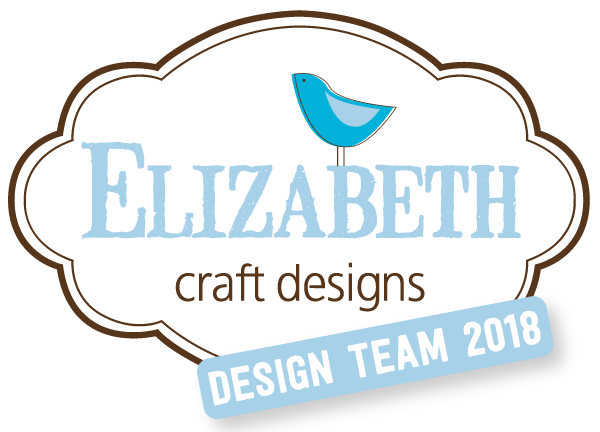 Awhile ago I ordered my first MFT card kit - of which I haven't had the chance to play with...yet! But in this order I added a stamp set that I've wanted since it's release and this week had a chance to play with it as well as my TomBow markers! I wanted to make a CAS card - really nothing too fancy, I just wanted to make these birds as vibrant as I could... So I used most of the colors from MFT color challenge and created this card. 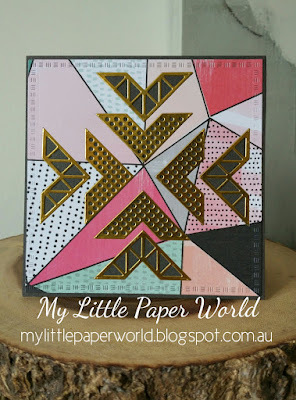 I first die cut MLPW Rectangle Nesting TRIBAL die using watercolour paper, stamped the sentiment then added the birds. I didn't use water (as TomBow markers can be water colour) but instead used the blending marker to blend the colours together. I was quite pleased with the brightness of the markers and the ease in using them. 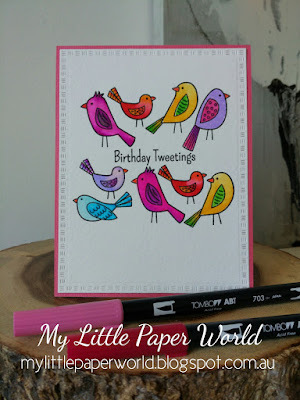 The stamp from MFT is called Tweet Friends. Had another play last night with Unity Sketch challenge and came up with this card! A pretty simple card really. 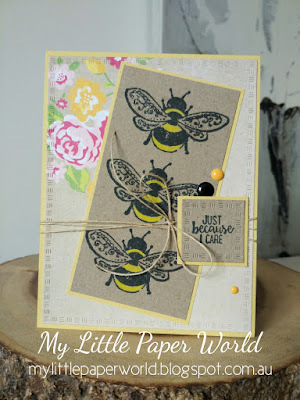 Used M.L.P.W Rectangle and Square nesting dies - TRIBAL to die-cut some paper, stamped Unity's (Bee)cause I care Stamp of the Week a few times, coloured with Prismacolor pencils and its done! I also added Wink of Stella - clear to the bees wings which you can see a little better in the photo below. Paper Flourish Card Kit - Now Available! 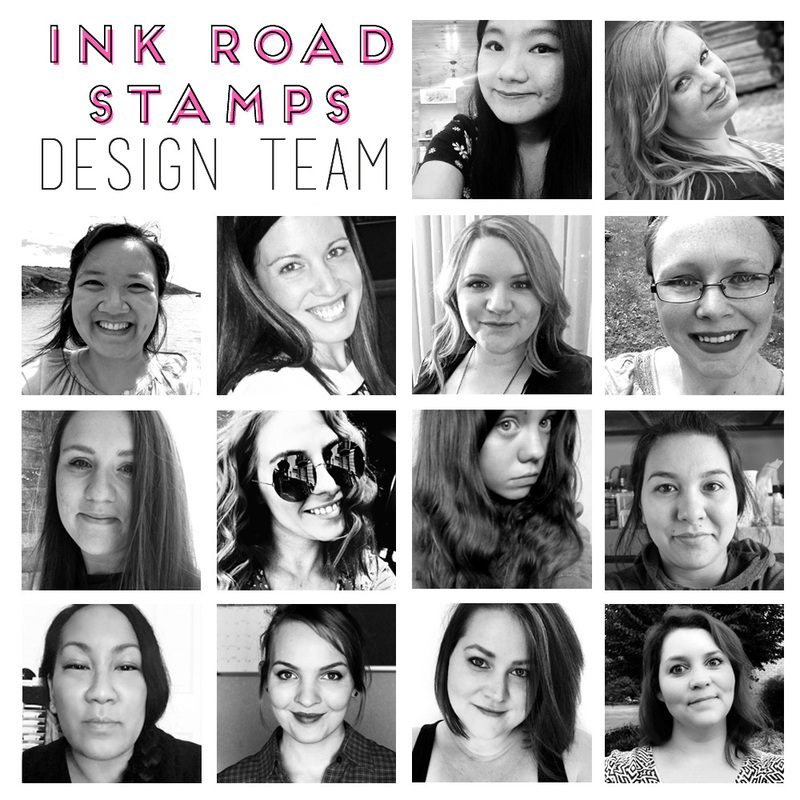 Last month I shared a sneak peak of my May cards created for this months release from Paper Flourish. This kit has been very popular and is now available for sale! 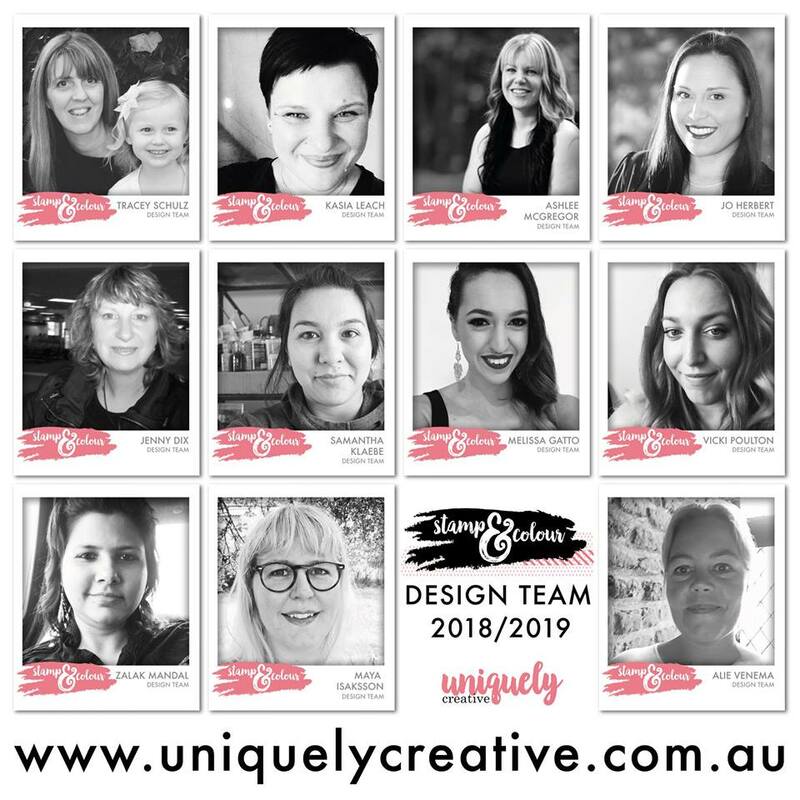 This is my last month of being part of Paper Flourish Design Team - My 12 month term has gone by so quickly...I look forward to seeing what the new DT create with these great monthly kits! Head on over to Unity (Show & Tell) Facebook group - They hold weekly challenges (with lovely prizes!) that can be quite helpful when your in a creative mood but not sure where to begin! This weeks challenge is a sketch challenge - and they're not the easiest type of challenge for me! Other Supplies: My Little Paper World Rectangle Dies - TRIBAL, Distress Ink - Squeezed Lemonade, Twisted Citron, Abandoned Coral, Mermaid Lagoon, Tumbled Glass, Wilted Violet, Shaded Lilac, Spun Sugar, Picked Raspberry. Versafine - Onyx Black, Clear - Wink of Stella. It's a simple card, so I made a few with different colour combos!